Once you buy a boat lift from Docks Unlimited, you’re already going to receive a quality product that won’t leave you disappointed. However, if you want a little more out of your boat lift, consider giving it that extra touch to really make it your own. Carrying a selection of add-ons to upgrade your boat lift, we at Docks Unlimited have everything to make sure you have the best possible experience at the lake. Check below to see our additions available and get some today! As you know, your boat is an investment, and, as such, you need to do everything you can to make sure it lasts as long as you need it to. So, when you’re not on the boat and the sun is still shining, the best way you can protect it is with a quality boat lift canopy. 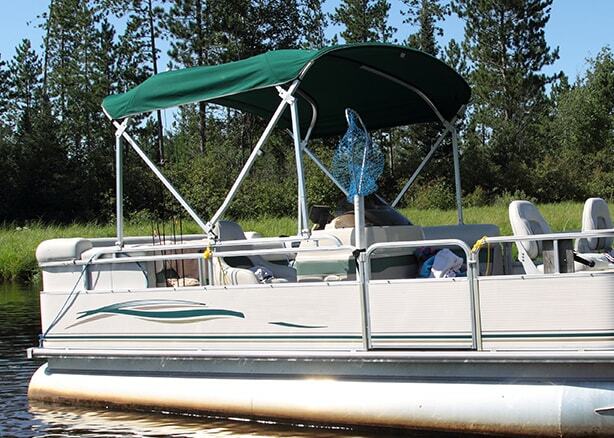 At Docks Unlimited, we sell all styles and sizes of aftermarket boat lift canopies, so you are sure to find what you need. With a variety of colors to choose from, your canopy can protect your boat while looking great on your boat dock. Feel like taking the boat out for a late-night cruise? Spend more time out on the water than planned? That’s okay! 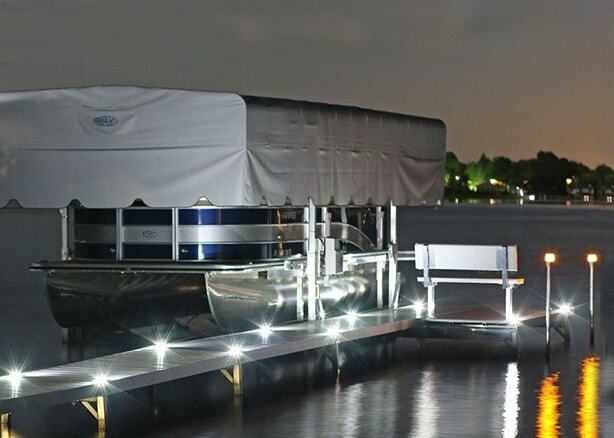 With Lake Lite’s solar lighting, you never have to worry about getting your boat back in its lift in the dark again. From dock post lights to pole mounted lights, Lake Lite’s solar lighting will guide your way back home to safely load into your boat lift. 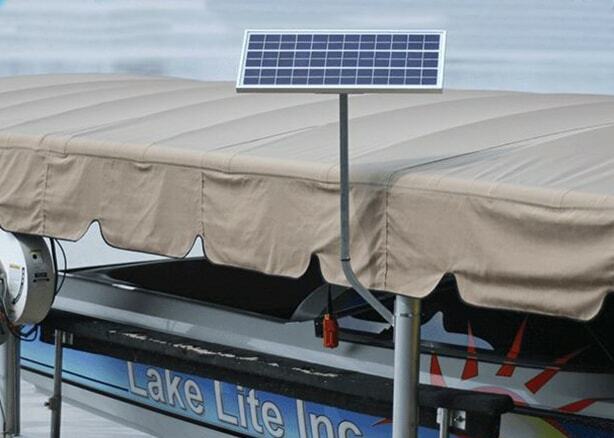 Lake Lite’s products run for hours and hours on a full charge, and their hands-free energy efficiency makes them a prime choice for your boat dock. Everybody likes things that are free, and energy is no different. If you’ve made the investment to get a hydraulic lift for your watercraft, why not go the extra mile and get a solar-powered system for your lift? Solar panels on hydraulic lifts harness the suns energy to power your boat lift, making your lift cost-effective in the long run. With a solar panel powered lift, your effort in providing power also becomes maintenance free. The best days spent on the lake are when the sun is shining, and a solar panel charger will make the experience that much easier for you. If you want a hydraulic boat lift but aren’t sure what the best type of motor is to do the job, you’ll want to try out Lift Tech boat lift motors. 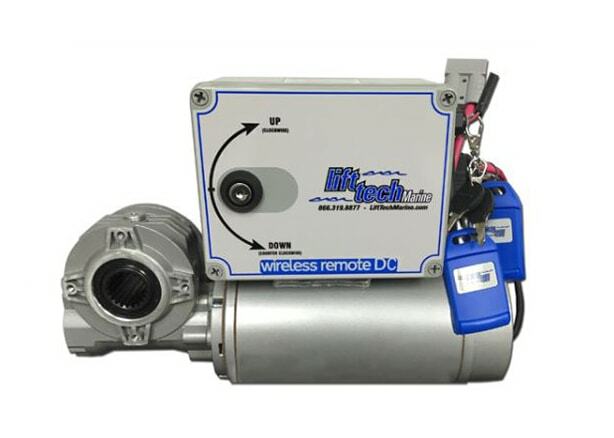 With the ability to fit any boat lift that has a wheel, Life Tech motors are versatile and powerful. Capable of lifting to a 7,000-pound capacity, Lift Tech boat lift motors can lift almost any watercraft. With the option of a manual boat lift motor or remote-controlled motor, Lift Tech guarantees a good experience with their boat lift motors.